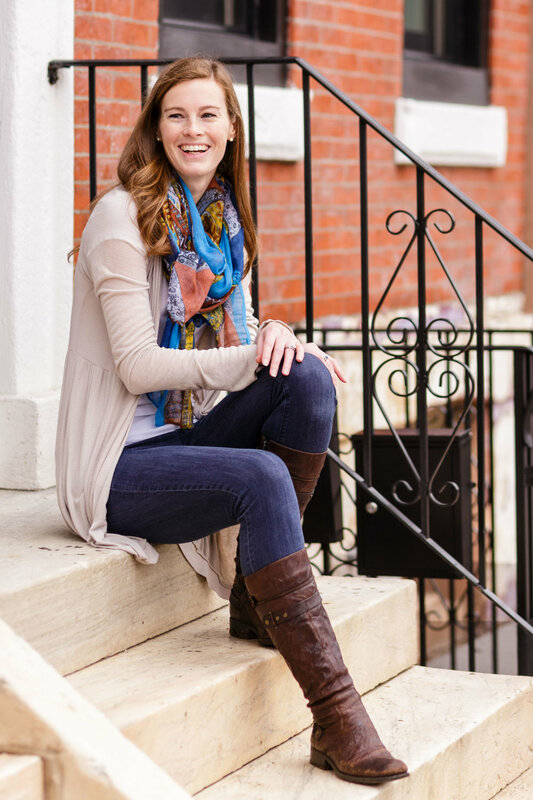 Welcome to the third installment of the "Meet the Maker" series here on the Mix & Match blog! If you enjoy reading this interview, check out the others in the series here. I'm so excited to introduce you to Chentell Shannon - the woman behind the beautiful modern ceramics design and manufacturing company, Convivial Production. I was recently introduced to Chentell by a mutual friend who recognized that we had a similar aesthetic and boy was she right! The moment I clicked over to Convivial's website, my jaw dropped - I wanted to find a place in my home for every single one of her amazing pieces. You'll get a peek at them today, but make sure you head over to see all of them yourself too. And if you need further validation that her pieces are just as lovely in real life as they are in the photos, her shop on Etsy has an average rating of five stars with over 600 reviews! Chentell was kind enough to send over one of her pieces for me to see for myself, and next week, I'll tell you all about it here on the blog. Stay tuned! *Update* Come on over and see the 2V Geometric Hanging Planter in my office! Now let's hear more from the founder herself - a very warm welcome to the Mix & Match Design Company blog, Chentell! Tell me a little bit of your story. Where are you based? What’s your personal/professional background? My name is Chentell Shannon. I am a visionary and an entrepreneur paired with the technical skills of a modern potter. I am efficient, selective, introverted. I am the owner of Convivial, a ceramic-based manufacturing and design company that specializes in creating home, table, and garden wares. I was born and raised in Hawaii, lived in Chicago for my undergraduate degree, and have landed in Kansas City. My education is in Community Art, Urban Studies, and Ceramics. Tell me about Convivial - how did you get started and what made you want to design and manufacture ceramics? Where did the name come from? I started Convivial in the basement studio of my college classroom. The month post-graduation I hid myself away, working day and night to produce our first line of products. I've always had a love for hospitality and my love for ceramics has grown out of the ways functional wares can be used to gather and host individuals. Convivial, a form of the word conviviality, comes from the latin origin "to live." Over the years it has evolved to mean "to feast, (of an atmosphere or event) friendly, lively, and enjoyable," and in my understanding, "the joining of individuals to eat, drink, and be well with one another." Convivial was born from the idea that as a company we can create wares that will spur on conviviality - to inspire others to host and to provide items that set the scene to do so. The tablewares we create will seek to bring individuals around a common table, and our home and garden items will serve to create a atmosphere that is warm and inviting. How did you land on Convivial’s signature minimalist, modern look? When I moved from Hawaii to Chicago in 2009, I was captivated by the city architecture. The skyscrapers, bridges, and water towers specifically stole my attention. The initial designs within Convivial were all structured - designed after the architectural features I was seeing all around me. This is the quintessential Convivial design style. Our wares simply evolved from there to include less-structured pieces that reference architectural features of buildings, windows, rooflines, etc. Because architecture holds such timeless design features, I thought it best to pair these designs with what has become our signature ivory glaze to allow the shapes to really stand out. What does your design process look like from idea conception to production? Do you study trends or do trends affect your design process? When it's time to release a new collection of work, I typically decide on a outline of the types of products that I'd like to make. I'll have in my mind, for example, that I'd like to create a new set of dinnerware, 3 planters, a candle, and so forth. From there I walk the city and take notes of various shapes and forms that may work for these products. I will try to see the form as these products that I am hoping to create. Then I create a prototype and a series of molds that will be integrated into our production system. I never study trends. This is very important to me and has been a huge commitment I made from the start of Convivial. I study architecture and I study the needs of the common home. I put on blinders - never looking at Pinterest or other companies in similar fields. My hope is that by doing so I can truly pursue unique ideas that hold the timeless features of the buildings that surround us. In turn, I hope our wares will hold the same timelessness within the homes in which they find themselves. You mentioned that you started out as a one-woman show, and now the business has grown into a small team of women who works out of a 2,500 square foot production space. How and when did you decide to hire on employees and move to a larger space? Knowing the right time to hire is always a challenge. Convivial has decided to bootstrap, meaning we do not take on outside investment. We only work within our financial means. This tends to creates the situation where we need more help than we currently have, and as we grow it becomes more and more obvious that another set of hands is needed. I've noticed a personal trend that I hire when my work exceeds 10 hour days, 7 days a week. Mentally, I know I should hire sooner, but I am very conservative with how I allocate finances. As we grow, however, I notice that my comfort level stretching our financial capabilities also grows. I am proud of myself for this. It's uncomfortable, but it's necessary to trust myself as well as challenge myself as a business owner. Expanding our production space is the same process mentally. I have a knack for creating a very efficient space. I will push the production spaces we use until they cannot handle our needs, then I will pull the trigger to expand. Though it isn't easy to know when the time is right, once the decision is made, there is no looking back. As a follow up to that question, I know that your husband, Stephen, is a part of the team as well, and as it says on your website, he has been “wildly influential in the company’s growth.” (I love that!) Tell me a little bit about what it’s like being a husband/wife team, and what his part in the business is. Is he full-time with Convivial as well? I truly believe that my husband and I couldn't be a better match to work together. I didn't realize this at first, but the more experience we have working alongside each other, I am blown away and in a sense, honored, to have the dynamic we hold. Convivial, as a company, is 100% a result of my initial vision and technical work. I am the sole owner and implementor of the company Convivial is today. Stephen, however, has been there every step of the way. We constantly banter back and forth about the opportunities, challenges, and ideas that present themselves. Throughout the day our communication is dominated by the day's happenings. We celebrate victories together. We strategize our way through challenges together. I think of Stephen as an endless idea generator. He is constantly thinking of ways to improve our products, our systems, our customer experiences. When I hear his ideas and make decisions on what will be best to pursue versus lay to the side, he is incredibly resilient and admirably humble. In a company meeting today he talked to our staff about how proud he is that I have built the company into what it is today - despite the challenges, despite sexism that I've experienced. It was hard to keep tears from welling in my eyes. How beautiful is his soul! For now, Stephen has full time employment at a developmental research lab locally. After work, he devotes his free time to work as our Sales Manager, handling all wholesale accounts and customer service inquiries. He hopes to join our team after he has completed his Ph.D. Until then, we are grateful to have him involved in any and every way possible. When you imagined your career path, did you think it would involve becoming a small business owner and creative entrepreneur? What are your favorite parts about having your own business and what’s most challenging? Yes! I have always imagined myself running a ceramics studio. I did not imagine that it would be manufacturing designer goods, but I am happy with the way different opportunities have led to the place Convivial is in today. The majority of my family members - immediate and extended - are small business owners. Looking back, I now realize that I had very limited examples of prominent adult figures in my life who worked for corporate companies or as employees of smaller organizations. My favorite part about owning my own business is that I get to shape it into what I want it to be. Within our means, I am able to say yes to opportunities that fit the Convivial vision and in turn, say no to opportunities that don't fit. The most challenging part is growing through the pains of meeting demands without putting the company in a precarious spot. Another challenge - which I won't fixate on long, but I think is worth mentioning - is the sexism I have experienced as a successful woman in business. Traversing this terrain with grace has been difficult and at times disappointing. You just relaunched your website and released a new collection. What are some of your favorite pieces from it? Tough question! 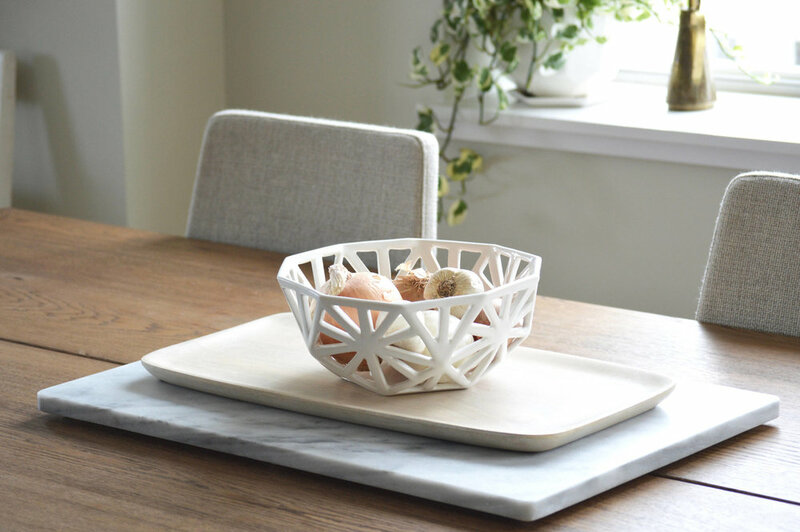 From our Home Collection, I can't help but choose our 2V Geodesic Fruit Bowl (shown below). This is a design that I've had in my mind for 2 years now. It holds the classic Convivial feel. It's a complex, eye catching design and I love seeing it fill our production space. From our Table Collection, our Riveted Dinnerware is my favorite. I love how the simple facets around the edge of the plates makes any dish seem so fancy. Last, from our Garden Collection, I cannot choose! Our home has every single planter design that we carry and I could not do without them. They're all so special and complement each other in subtle ways. In five years I hope to be in a 8-10,000 square foot building that hosts our manufacturing space, as well as a retail and hospitality area (a cafe or coffee shop). I'd like to be able to invest in our staff's long-term personal goals, as well as be able to invest in Kansas City's developing community through beautification projects. My husband and I are also tapping into real estate. We're sitting on some ideas there but will keep those hush-hush for now. Where can everybody find your products and follow along with you? Our website, convivialproduction.com, hosts our shop as well as a list of 50+ retailers that carry our work across the US. Additionally, we share a lot of first-hand news, sales, and inspiration via Instagram @convivialproduction. Follow along! Wow, thank you so much for sharing your story and all about Convivial today, Chentell! It's always fascinating and inspiring to hear about another creative entrepreneur's journey. To my Mix & Match friends, head on over to Convivial's account on Instagram and say hello - let her know what encouraged or inspired you from today's interview! All images courtesy of Convivial.